Recreation is an essential and growing activity in the United States and the rest of the world. It is an activity that a person does for enjoyment, usually to refresh the body and mind. Recreation often involves some degree of exercise as well as visiting areas that contain bodies of water such as parks, wildlife refuges, wilderness areas, public fishing areas, and water parks. Recreation is popular for various reasons. Besides being a way to enjoy free time, many people use recreation as a way to socialize. For instance, according to the American Recreation Coalition, 88 percent of parents believe that participating in recreational activities strengthens family relationships. Parents ranked camping as the best outdoor activity, followed by hiking, bicycling, and fishing. Recreation can be categorized into two general types: active and passive. Active recreation, entailing direct participation, involves activities such as jetskiing in bays and kayaking down rivers. Passive recreation, involving observation, includes such activities as walking along rivers, sunning at beaches, and watching swim competitions. According to the U.S. Bureau of Reclamation, recreation and tourism is the largest industry within the western states and second largest U.S. employer. Outdoor recreation in the United States is a $350 billion industry, with approximately $140 billion attributable to public lands and $40 billion to public waterways. Recreation and travel combined is one of the world's largest businesses. 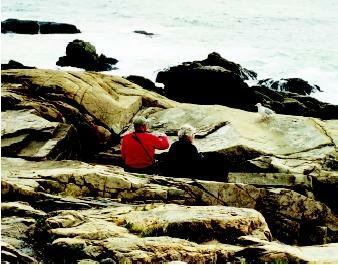 Coastal areas draw hikers and other people seeking recreational opportunities near the water. These hikers in Maine's Acadia National Park pause for a snack, drawing the attention of a seagull. In the United States, many public agencies and private organizations involved with natural resources are actively dealing with recreational activities. State and local governments operate over 54 million acres of recreation lands, with more than 30 million acres in the eastern United States. Over 95 percent of the 690 million acres of federal recreation lands are in western states. About 23 percent of private land is open to public recreation, but is decreasing due to conversions toward other purposes. Numerous surveys show that water-based activities are among the most popular recreation activities. Statistics also show that U.S. citizens strongly rely on publicly owned and managed reservoirs and lands for many of these recreational activities. Certain lands around public reservoirs are open for recreational uses such as hiking, hunting, snowmobiling, and snow skiing. In addition, their waters are available for activities such as boating, water skiing, swimming, fishing, and canoeing. Sometimes restricted zones are set up so that certain activities, such as fishing, do not interfere with other activities, such as swimming. Even a medium-sized hydropower project can have recreational and tourism value to residents and visitors, provide jobs for thousands, and have a monetary benefit in the millions of dollars. The 1994–1995 Nationwide Survey on Recreation and the Environment (NSRE) conducted the most extensive survey in the United States concerning the country's natural resources. The NSRE was a cooperative research effort designed to establish benchmark and trend data to better understand recreation use and public attitudes. The survey found that the four most popular recreational activities to be visiting a beach, walking for pleasure, sightseeing, and outdoor family gathering. Sailing is a popular activity that can be undertaken on the high seas and in coastal waters as well as on inland lakes, reservoirs, and large rivers. Wind-driven watercraft can range in size from small (e.g., catamarans) to large (e.g., schooners). 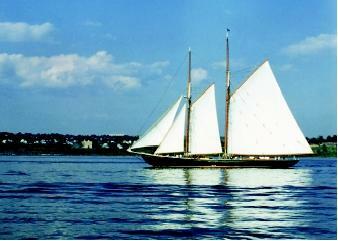 This sailboat passes through Nova Scotia's Halifax Harbor. The participants examined in this study showed strong overall recreational involvement. The results also focused on three distinct grouping of differences among participants: the consumptive group; the water-based group; and the learning-and-passive group. The consumptive group showed much higher interest in traditional "consumptive" activities such as hunting and fishing. The water-based group was dominated by young males who were involved in a wide variety of recreational activities, especially those based on water adventures. The learningand-passive group contained a majority of highly educated, older women who were most interested in learning and viewing about activities, and in participating in popular outdoor activities such as family gathering, picnicking, and walking. In order to improve planning and management for these participants, the survey provided recommendations for appropriate services and facilities at the recreation areas, formulated policies, and encouraged proper use of natural resources. Activities that are expanding in popularity are cross-country skiing, downhill skiing, backpacking, day-hiking, running and jogging, pool swimming, and visiting prehistoric sites. By 2040 the most popular recreational activities are anticipated to be bicycle riding, swimming, pleasure driving, walking, dayhiking, sightseeing, wildlife observation, picnicking, family gatherings, photography, visiting historic sites, and developed camping. With increased interest in the environment and nature, it is important to create effective strategies for developing recreation to meet growing demand, particularly in areas close to water. Recent surveys have shown that extended long-distance vacations are being replaced by more frequent, closeto-home recreation trips. As a result, the importance of recreation opportunities close to urban areas is being acknowledged. Wakeboarding (a form of water skiing) had humble beginnings in the 1980s, but by 2000 had become the world's fastest-growing water sport. 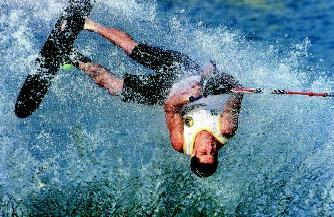 Here a tournament skier executes a flip during the Water Skiing World Championships. Recreational areas near urban areas represent one of the most important opportunities to meet the increasing demand for recreation. One major role for the government and other federal, state, and local agencies, is to manage recreational areas. Increasing public access to both public and private properties will be necessary in the future as more people spend more time in recreational pursuits. Moreover, achieving sustainable recreation in coastal areas will require examination of issues such as continued sprawl development, growing constraints upon public access, nonpoint pollution generated by recreational activities, and other forms of environmental degradation caused by intensifying development and multiplying recreational activities. SEE ALSO Bureau of Reclamation, U.S. ; Fish and Wildlife Service, U.S. , Instream Water Issues ; National Oceanic and Atmospheric Administration ; National Park Service ; Reservoirs, Multipurpose ; Tourism ; Uses of Water. Kelly, John R. Leisure. Englewood Cliffs, NJ: Prentice Hall, 1982. Coastal Recreation and Tourism Pages. Oregon Sea Grant. <http://seagrant.oregonstate.edu/crt> . Cordell, H. Ken et al. An Analysis of the Outdoor Recreation and Wilderness Situation in the United States: 1989–2040. General Technical Report RM-189. Fort Collins, CO: U.S. Department of Agriculture, Forest Service, Rocky Mountain Forest and Range Experiment Station, 1990. Available online at <http://www.fs.fed.us/pl/rpa/rec89.htm> . Executive Summary (Values of the Federal Public Lands). Natural Resources Law Center <http://www.colorado.edu/Law/NRLC/fedlands.html> . REC Facts: Insights into Trends, Developments and Other Curiosities in the World of Recreation: July 2002 Edition. American Recreation Coalition. <http://www.funoutdoors.com/RecFacts/index.html> . Recreation. Tennessee Valley Authority. <http://www.tva.gov/river/recreation/index.htm> . Recreation Management. Bureau of Reclamation, U.S. Department of the Interior. <http://www.usbr.gov/recman/lnd/lnd-p04.htm> .